"Ever since I was young I was fascinated by Neggs. Now I’m the host of the premier Negg event!" Welcome Topsi! I’d like to thank you for taking time to do this interview while you’re cleaning up after another successful Festival of the Neggs. "No problem, personally I appreciate the distraction. While I’m super excited to host the Festival of Neggs, I’m not so super on the boring parts. Especially leftover Negg retrieval, it’s much more fun to find places to hide Neggs than trying to remember where you hid them all. Also some Neggs have been sitting out in the open for a few days so they’re not the freshest when I find them again." Oh, well at least you have your own hints to remind you where they are. But first things first: an apology. I actually meant to do a proper Character Introductions for you last year. I can make excuses but that’s beside the point, you still deserve an apology. "Oh don’t be so down, it’s alright. Honestly I’m kind of glad you didn’t as I wouldn’t know what to say. Now that I have another year under my belt I feel much more confident and prepared to answer your questions." Thank you and glad to hear. So since you sound ready let’s get started. Recycling one of the original questions I had planned for you last year, how did you end up becoming the host of the Festival of Neggs? Isn’t that usually done by the Negg Faerie, Kari? "Well obviously Ms. Kari gave me the position. Actually I would more say this is my first year hosting the festival. Last year Kari was still around to assure everything went smoothly, but this year she stayed in the Neggery. But back to the question, Ms. Kari said during the Festival of Neggs the Neggery gets a lot of customer and it began being bad for her business being away from the Neggery for so long. She decided it may be time to pass the torch and so looked to Neopian’s number one Negg fan group: The Negg Network! That’s where she found me; I’m not only the host of the Festival of Neggs but the Negg Network’s Negg Collection Caretaker. It was my great care of the club’s Neggs that Ms. Kari liked about me and so chose me to be the newest host!" What a great honor. I’m sure everyone in your club must be jealous. Speaking of which, would you mind telling us more about yourself? 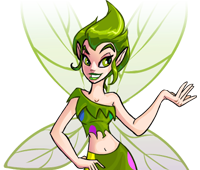 To most of Neopia you seemingly appeared out of nowhere and despite this being your second year hosting we still don’t know much about you. "Oh, my fellow club buddies are jealous like you wouldn’t believe! The club president even joked that now I was host I didn’t need to be a member of the club. At least I hope it was joke, at the time he did seem mad Ms. Kari picked me over him. But as for me, there’s not much I think anyone would be interested in. I’m from the Happy Valley at the base of Terror Mountain. However, while the other local Cybunny kids did hopping races through the slopes and hills, I spent my time in the Ice Caves at the Neggery. There’s not much color in Terror Mountain, a lot of white and light blue, so when I saw the colorful Neggs I was just drawn to them. So I spent my early days hanging around the Neggery, and from it I learned about Neggs and the mystery around them. I decided that I wanted to become a Negg farmer, but growing Neggs isn’t as easy as it sounds. I failed, not from trying, but it takes a lot of resources to grow Neggs that unless you have a lot of NP you can’t really grow Neggs and also make a living from it. But when trying to become a Negg Farmer I joined the Negg Network, was put in charge of the club’s Negg Collection because I knew how to take care of Neggs, and that brings us back to Ms. Kari picking me to become the next Festival of Neggs host." So sounds like everything came full circle. Before we wrap up I’d like to bring up a certain rumor that has come up about you this Festival of Neggs. Some Neopians have interpreted the clues given in a bit of a sinister way. While all your clues have been twisted to fit the theory, I want to focus on the clues which started the rumors: You needing extra furs, getting a weapon in an unusual way, you needing a katana, and how we shouldn’t follow you unless we’re adventurous. Care to explain some of these odd clues? "*Topsi closes his eyes and gives a slight smirk* Well I’m not all that I seem, I do have hidden depths... *opens his eyes and gives a giant, goofy smile* But these clues have been taken out of context and greatly exaggerated. Needing new furs? Certain Neggs need a soft material that can keep them warm and fur fits that description, even Ms. Kari uses fur if you couldn’t tell from her dress. Getting a weapon in an unusual way? That was just from chance, it’s the clue for the Neggs I hid at Coltzan’s Shrine and on the day I hid them I got a weapon when I visited the shrine. I often come up with all the clues on the spot like that. Needing a katana? Speaking of weapons, is it that strange I have a weapon set like every other Neopet? I had worn down my previous sword playing Negg Ninja and thought while I was in Shenkuu I would get a new one, a katana specifically. Finally, saying not to follow me unless you’re adventurous? Well I did hide the Neggs in forbidden parts of the Haunted Woods and Krawk Island; they’re not places for the faint of heart. I’m just a Cybunny who really likes Neggs and it takes a good heart to take care of Neggs." I guess put in that way it all makes sense. Well that’s all the questions I have and I don’t want to distract you much further. Is there anything else you’d like to say? "I don’t know. I guess I could try saying something inspirational. Hmm, I guess I’ll just say don’t give up but also don’t be afraid to try new things. Wait, that seems a bit contradictory, let me try to explain. If you feel passionate about something than follow your dream, however sometimes what you want to do just can’t be done; but that doesn’t mean the end. You’re much more than just one thing, be open to new possibilities and you may find a new dream. Take it from me, I wanted to be a Negg farmer but just didn’t have the resources, however during that time I joined a group which eventually led me to being host of the Festival of Neggs!" "The decision to stop being the host for the Festival of Neggs was a very hard decision for me, I am the Negg Faerie after all and the one who founded the Festival of Neggs. Ironically one of the reasons why I started the Festival of Neggs is why I can’t be its host anymore, bringing more attention to Neggs. I had hoped it would bring in more customers to the Neggery, but not the sheer amount that it did! There’s no way Zaira was able to keep up, I had to return to shopkeeping the Neggery during the event. However I’m glad that I was able to find a very capable replacement in Topsi who has done a fantastic job! I would have allowed Zaira to try and host it but our arrangement was only for her to be my assistant; besides she needs to focus on her Faerie Academy studies. 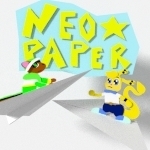 So I went to the biggest Negg fan club in all of Neopia, the Negg Network. I was intending to ask the club leader to be the host, but as I met each member I saw Topsi at work taking care of the club’s Negg collection and felt he had the right qualities to be the host to the Festival of Neggs: a kind heart, strong dedication, and a love and understanding of Neggs." "Dearie, do I have some scoop on Topsi. Far be it from me to spread gossip, Fyora forbid, but when you know something about someone who has rumors about them how can you not? So Topsi, you all think those clues of his making him sound like he’s up to no good. Oh, and he is, but you all got the wrong idea on how. Topsi ain’t no crazy with a sword, he has a much deeper secret that if found out could make him being host to the Festival of Neggs come to question. You see, Topsi is a Negg hoarder. Hadn’t you notice since Topsi took over the number of days for the Festival of Neggs has gone down? It’s not because they have less Neggs than previous years, on the contrary, they have the same amount or even more. Topsi is a Negg maniac; he not only hoarded extra Neggs from this year’s Festival of Neggs but also last year’s. Imagine the controversy; something like this would have never happened with my Neggtacular Springtime Celebration. Actually, I just had a grand idea; how about I bring back the Neggtacular Springtime Celebration! We don’t need a Festival of Neggs with an untrustworthy host when you have little ol’ me. *gives a giant, toothy smile*"
"Oh I’ve met Topsi plenty of times. Real nice guy. Took good care of our club’s Negg collection. Did you know nearly half of those Neggs are from me? I’m a Negg Hunter. Fastest one in the whole club. 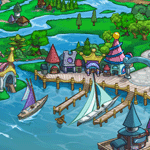 We keep a lookout for rare Neggs all over Neopia. If we see one we try to get it. Searching, winning, purchasing, trading. No matter how, we get the Neggs for the club. But this isn’t about me. This is about Topsi. Topsi’s job is just as important. We find the Neggs but he makes them last. Makes sense for the Negg Faerie to choose him. But the club leader doesn’t agree. He’s jealous Topsi was picked over him. I actually think he was going to be the host. However when the Negg Faerie showed interest in Topsi he got annoyed. I think the Negg Faerie noticed and why she didn’t pick him. I might have also picked Topsi or someone else over him. Great leader but big ego. I think he would get angry every time someone found a Negg he hid. Kind of defeats the purpose of the Negg hunt." The Negg community is certainly made of interesting characters. But that ends this edition of Character Re-Introductions! 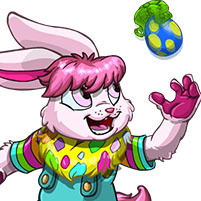 I think we learned a bit more about Topsi, a Cybunny from Happy Valley who wanted to be a Negg farmer but through chain of events ended up becoming the host of the Festival of Neggs! We also dispelled those rather sinister rumors about him, of course there seems to be more rumors beneath the surface (though the source is questionable so who know what’s true). Whether Topsi and the Festival of Neggs return next year we’ll have to see, just as with the next Character Introductions. Until then, have a happy and fun Spring!